The USS ALBANY (CG-10), an Oregon City-class heavy cruiser, was commissioned on 15 JUN 1946 as CA-123. USS ALBANY served her country for 34 years, 2 months and 14 days, until decommissioned on 29 AUG 1980. Commissioned after WW II, ALBANY served on the East Cost in the late 1940s and into the 1950s. 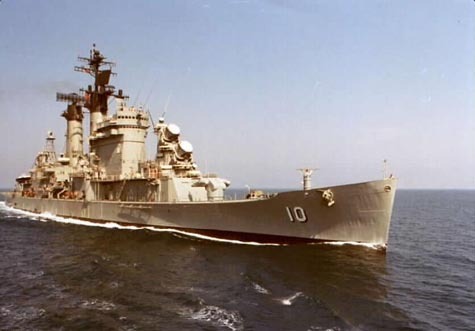 In 1958 she was placed out of commission and commenced a four year retro-fit to become a guided missile cruiser, CG-11. Exiting the ship yard in November 1962, ALBANY began a second chapter of East Coast service, but this time with periodic deployments to the Mediterranean, Caribbean and North Atlantic until 1975. From 1976 to 1980, USS ALBANY served as the Flag Ship of the 6th Fleet and was homeported in Gaeta, Italy. ALBANY was decommissioned in August 1980 and subsequently sold for dismantling in 1990.